Welcome to the December 2010 edition of ACE NorCal News! Saturday, December 4th, 2010 marked the day for the annual ACE Holiday Party. As usual, it took place at Playland-Not-at-the-Beach. Approximately thirty people showed up for the event and much fun was had by all. In the morning, a new exhibit room, Roller Coaster Rampage, was opened in the building. ACE members gather outside prior to the ribbon-cutting that would open the new Roller Coaster Rampage exhibit. The all-new room features an authentic Arrow Development roller coaster car from the Giant Dipper in Santa Cruz. The car operated on the ride from 1955 to 1976. ACE members Nancy Redden and Mike Chew donated the coaster car. Nancy was on hand to do the ribbon-cutting to open Roller Coaster Rampage. In the new Roller Coaster Rampage room, the coaster car is positioned in front of a projection screen where POVs of roller coasters were shown, simulating actually riding a roller coaster! After a few hours in Roller Coaster Rampage, lunch was served in the Penny Arcade. Lots of delicious food was on hand: corn dogs, nachos, and all kinds of snacks and desserts. When lunch was over, we all headed over to the front of Playland where we watched Professor B’s Flea Circus. Thankfully, none of the visitors or ACE members at Playland had their dogs with them! Many fleas performed such as Fifi LaFlea, the amazing Fleo, Evil the Fleavil, and Elvis Presflea. In the afternoon, Jim Smith, author of the new book Playland at the Beach: The Early Years gave a presentation on the beginnings of Playland-at-the-Beach. After the presentation, Jim was on hand to sign copies of his book (you can buy it online at the Playland-Not-at-the-Beach store). Of course, the party included the fun and exciting Gift Exchange game. A lot of stealing back and forth went on this year, particularly from ACE member Matthew Pearce! There were many great gifts including the incredible, and amazing … Shmuzzle Puzzle. On the puzzle was a photo of the American Eagle at Six Flags Great America. Following the gift exchange, the ACE NorCal Spirit award was given out. The recipient this year was ACE member Ray Harris of Modesto. In recognition of Ray’s efforts in roller coaster preservation in 2010, Ray was presented the award, which consists of a plaque and a one-year renewal of his ACE membership. Congratulations, Ray! ACE member Derek Willhite served as the auctioneer. Before we even knew it, the auction had come to a close after many laughs and high bids by Matthew Pearce. (Emi sure enjoyed it!) The auction raised $830.00 to benefit ACE Preservation and Archive funds. I won some Roar wood which will look very nice on my wall, or for my cat to sit on. Boardwalk 100th Anniversary DVDs were presented to Cliff Aldecoa and Derek Willhite as prizes. 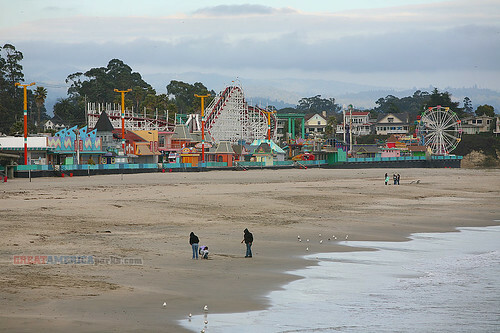 Many thanks go to the Santa Cruz Beach Boardwalk and Six Flags Discovery Kingdom for donating all of the cool auction items and prizes! I can’t wait to see all of you ACE members again next year! Merry Christmas! Derek Willhite auctions off a Giant Dipper sign. Derek Willhite auctions off a Boardwalk banner. Paul Asente shares a ride on Roller Coaster Rampage with Emi Pearce and one of her daughters. 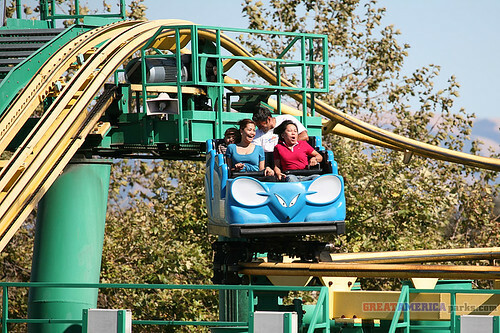 California’s Great America is closed for the season. December 4th marked the Grand Opening of Roller Coaster Rampage at Playland-Not-at-the-Beach and everyone seemed impressed with the results. Thank you to Nancy Redden for doing the ribbon cutting. Thank you to Nancy and Mike Chew for donating the 1950s vintage coaster car from the Santa Cruz Beach Boardwalk. If you are a member of ACE but could not attend the annual Yuletide Party, just show your ACE membership card on your next visit. You will receive a $5 discount on admission and a front row seat on Roller Coaster Rampage. A collection of roller coaster-themed pinball machines are soon to be added to the attraction area. Playland-Not-at-the-Beach is normally open to the public on weekends only, but the Museum of Fun has expanded its days of operation to include Sunday through Sunday from December 26th though January 2nd. Another new attraction will be unveiled during that week: The Devil’s Playground. Playland-Not-at-the-Beach is a 501c3 nonprofit built and run almost entirely by volunteers. They would be thrilled to invite any ACE members to participate as volunteers. Playland-Not-at-the-Beach nonprofit Museum of Fun, open to the public every Saturday, Sunday, and school holiday. Open evenings for private events 365 days a year. 10979 San Pablo Avenue, El Cerrito, CA 94530 (510) 592-3002. http://www.playland-not-at-the-beach.org . 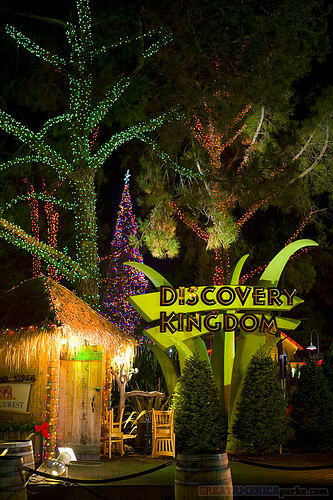 Admission $10 for kids (to 13), $10 for seniors (55 and up), and $15 for general admission. Admission includes 34 free pinball machines, penny arcades, carnival games, treasure hunts, miniature dioramas, and surprises around every corner. ACE members receive a $5.00 discount on admission upon presentation of their ACE membership cards. — Thanks to Richard Tuck for contributing this article.